a) confess our sins to Him. b) go to church and do good things. a) make things right with those we have offended. b) not be concerned if we have offended someone. a) to ask someone else to tell the person you offended that you are sorry. b) to go to the person you offended and speak to him or her alone. a) tell the person you are sorry, but it wasn't really your fault. b) say what you did wrong, not blame anyone else, ask the person to forgive you and wait for his answer. a) "I'm sorry I lost my temper, but you made me do it." b) "I'm sorry I lost my temper. Will you forgive me?" a) ask for forgiveness and return what you stole. b) just ask the person to forgive you. a) you can make up for it by doing something nice for them. b) you should go to that person and ask them to forgive you. a) you do not have to apologize to them. b) you are still responsible to apologize for your part. 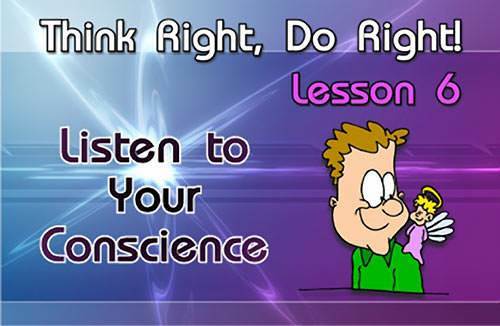 a) listen to your conscience! b) ask someone else what they think about it.